Figure1 shows an example toplogy. 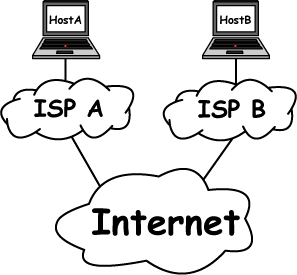 There are 2 nodes, which are Host A and Host B, and these nodes are connected to ISP A and ISP B, respectively. When you want a link which interconnects Host A and Host B like an ethernet link, P2P@i helps to construct such link by using virtual network technology. 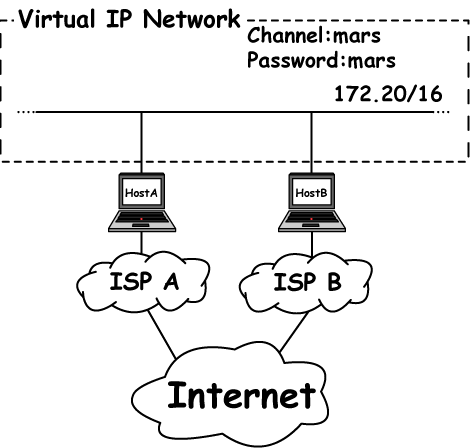 Figure 2 denotes a virtual IP network which interconnects Host A and Host B. Since messages on the virtual IP network are encrypted with AES256, Host A and Host B can communicate preventing eavesdropping. Then, we give how to set up and construct the network shown above. Before starting, please install and run P2P@i (seeCompile and Install). First of all, please access to the WEB UI (http://localhost:9200/) by your WEB browser such as Firefox. When you access to the WEB UI, you have to input user name and password. User name and password are specified by a configuration file of P2P@i. The configuration file places typlically "/usr/local/etc/p2pati/p2patid.conf". Second, please input valid hostname or IP address of your PC. Third, please connect to the P2P network. To connect, choose nodes from the list box and push the connect button. After connecting, the status would change as follows. Then, please create a virtual network interface. 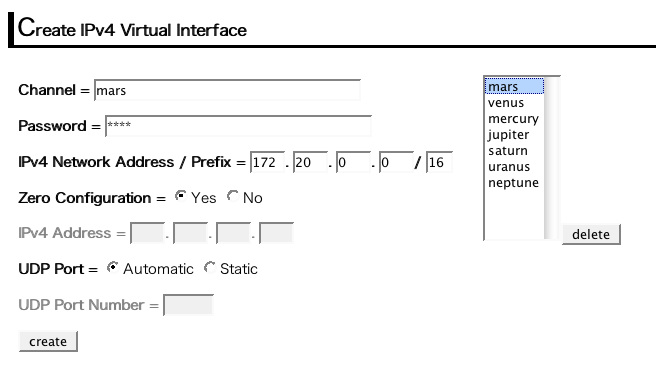 As figure 2, channel name, channel password, IPv4 network address and prefix are "mars", "mars", "172.20.0.0" and "16", respectively. Thus, please input these information and push the create button. If success, information of that virtual interface appears as follows.